You don’t have to be the biggest game in town to be the best, but a head start helps when you’re in it to win. 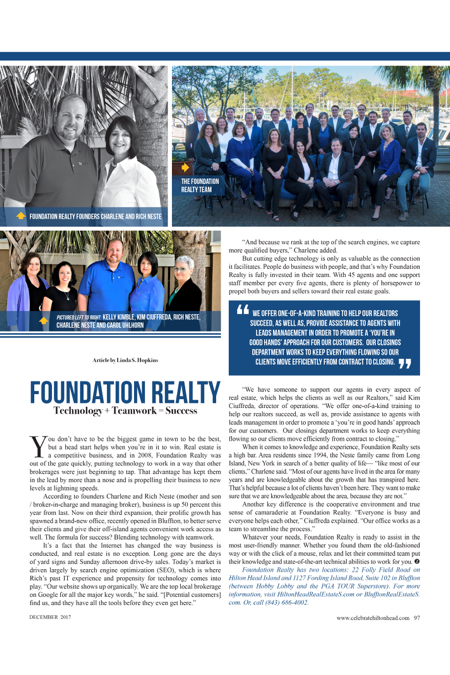 Real estate is a competitive business, and in 2008, Foundation Realty was out of the gate quickly, putting technology to work in a way that other brokerages were just beginning to tap. That advantage has kept them in the lead by more than a nose and is propelling their business to new levels at lightning speeds. According to founders Charlene and Rich Neste (mother and son / broker-in-charge and managing broker), business is up 50 percent this year from last. Now on their third expansion, their prolific growth has spawned a brand-new office, recently opened in Bluffton, to better serve their clients and give their off-island agents convenient work access as well. The formula for success? Blending technology with teamwork. “And because we rank at the top of the search engines, we capture more qualified buyers,” Charlene added. But cutting edge technology is only as valuable as the connection it facilitates. People do business with people, and that’s why Foundation Realty is fully invested in their team. With 45 agents and one support staff member per every five agents, there is plenty of horsepower to propel both buyers and sellers toward their real estate goals. Whatever your needs, Foundation Realty is ready to assist in the most user-friendly manner. Whether you found them the old-fashioned way or with the click of a mouse, relax and let their committed team put their knowledge and state-of-the-art technical abilities to work for you. Foundation Realty has two locations: 22 Folly Field Road on Hilton Head Island and 1127 Fording Island Road, Suite 102 in Bluffton (between Hobby Lobby and the PGA TOUR Superstore). For more information, visit HiltonHeadRealEstateS.com or BlufftonRealEstateS.com. Or, call (843) 686-4002.